Harry Potter costume designer Jany Temime discusses the challenges involved in dressing Professor Slughorn in Harry Potter and the Half-Blood Prince in a new interview with the LA Times. 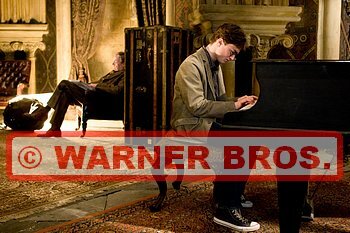 Thanks to Scar Potter, we now have a new and very interesting photo of Daniel Radcliffe and Jim Broadbent, where Daniel, as Harry Potter, is playing the piano… possibly a talent he perfected during his time on Broadway? Jim Broadbent, Horace Slughorn in Harry Potter and the Half-Blood Prince, describes his character as “a good man, a decent man, but a weak man” in a new interview with the Los Angeles Times. Broadbent, a fan of the books, praises the adaptations from page to screen. 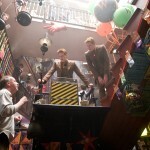 Half-Blood Prince‘s director David Yates is also a fan of the actor, noting that “he works exceptionally hard, and he makes everything look exceedingly easy”. 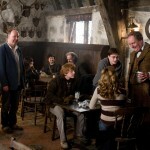 Two new behind-the-scenes photographs from Harry Potter and the Half-Blood Prince today. Both pictures originally appeared in Empire Magazine and show director David Yates and cast on set.